A team of scientists from the University of Surrey are preparing to send the world's first smartphone satellite into orbit. Called STRaND-1 (the Surrey Training, Research and Nanosatellite Demonstrator), this 30cm CubeSat weighing 4.3kg is powered by the Google Nexus One smartphone, and will launch into a 785km sun-synchronous orbit. Launch is scheduled for February 25th, after the build and test phase was completed in just three months. The mission is split into two phases: the first being to collect data about their surroundings using a number of experimental 'apps,' and the second being to test the capabilities of a standard smartphone in a space environment. Amongst it being the world's first smartphone satellite and the UK's first CubeSat, it will be an experimental test of new technologies such as ‘WARP DRiVE’ (Water Alcohol Resistojet Propulsion Deorbit Re-entry Velocity Experiment) and electric Pulsed Plasma Thrusters (PPTs); both ‘firsts’ to fly on a nanosatellite. It is also flying a 3D printed part – believed to be the first to fly in space! 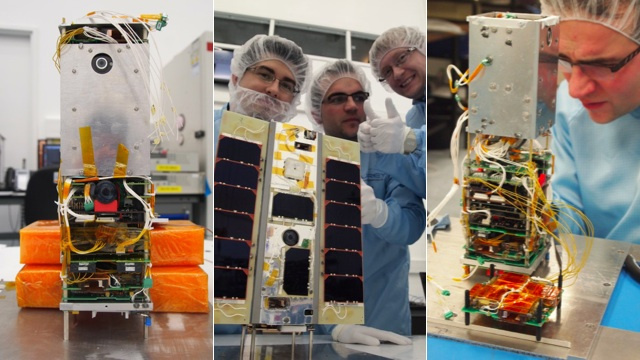 “We’ve deliberately asked this enthusiastic and talented young team to do something very non-standard in terms of the timescales, processes and the technologies used to put the satellite together because we want to maximise what we learn from this research programme. I can’t wait to see what happens next!” SSTL’s Head of Science, Doug Liddle said.